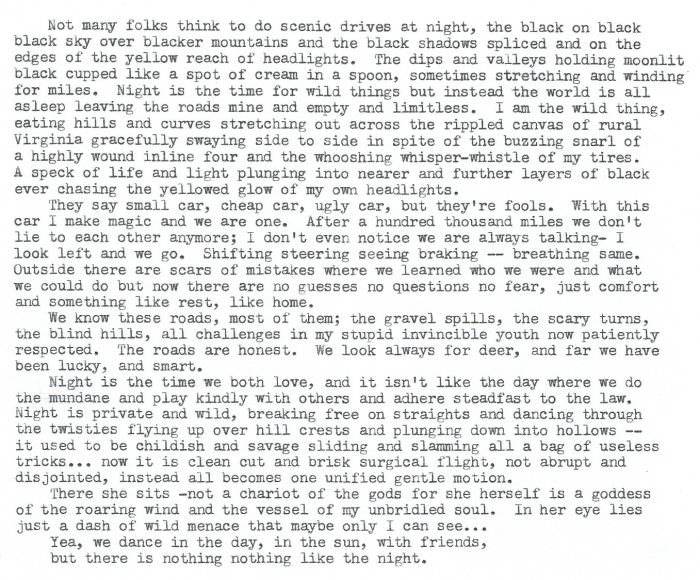 Sometimes saying to oneself "Ok, let's just write like Kerouac" is a method for writing terrible stuff, and sometimes it turns out all right. I did this bit in three quick drafts in rapid succession, the first to just barf it all out. Then I read it aloud, noted to myself which parts I did not like, and then wrote the second draft copying the first draft and making adjustments and adding and subtracting a few things. Then I read that aloud, and marked and made changes with a pen, reading it several times. I then typed this draft you see having made all my changes in pen and adding just a few more, mostly adding or removing punctuation or single words. I enjoyed this piece, more please! Mark, this is stellar. I too, enjoy the solitude of the night. It's almost as though the darkness fills up the space around me, but simultaneously makes everything seem endless. Moreover, night driving is another hobby of mine. I roll the top down in my convertible and take the back-roads of Tennessee to wherever I am going--or to nowhere at all. "After a hundred thousand miles we don't lie to each another anymore." I also noticed that you do not have any strikeouts. Do you type that proficiently, or do you just start over? I have tried to embrace strikeouts in my final products, but I still think they look awful. Yes and no, I do often type with very few errors (I realize now I omitted a word but it should be obvious -RE deer it is "so far" not just "far"). I did however use whiteout tape but I think I only used it twice. In a draft I do not care about strikeouts but in something I post or share I try to limit it to one or two a page. Generally I end up typing that well though. I use something between a two finger hunt and peck and proper touch typing, I make good speed, but it certainly offers more precision than the lazy touch typing I do on a computer.